Prostate Cancer Awareness Ribbon Pin is quality crafted. The Prostate Cancer ribbon pin is 1"x3/4". The Prostate Cancer pin has a butterfly military clutch backing for firm support. 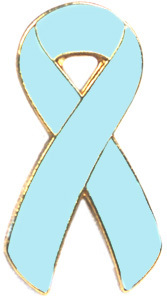 Show your support for Prostate Cancer with this quality ribbon pin. Makes a great gift idea.